I drive by Rockaway's (officially the Rockaway Athletic Club) every day. While I still love "The Rock" I really miss the old one. It was dark, run down, the bathroom situation sucked, the labyrinth of rooms was insane and finding a place to park was quite a feat. However, they had the original crawfish festival of their own, my best friend met her husband there, the doormen always walked ladies to their cars and the food was awesome. The Rock is well known for their Rockaway burger (pimento burger) throughout the South and beyond. The burgers have been featured in Southern Living magazine and George W. went there for a burger, took his check to the cashier only to realize that the President of the United States doesn't actually carry a wallet. So, yes, they have pretty good hamburgers. But, what the old Rock had was REALLY good FOOD. I don't remember, or maybe I never even knew, who the cook was "back in the day." But, whoever he was, he was awesome. The fried green tomatoes were the best I've ever had. Ever. There was a prime rib dinner that was not at all what you would expect from a bar. It was perfectly cooked, well-seasoned and an incredible price. 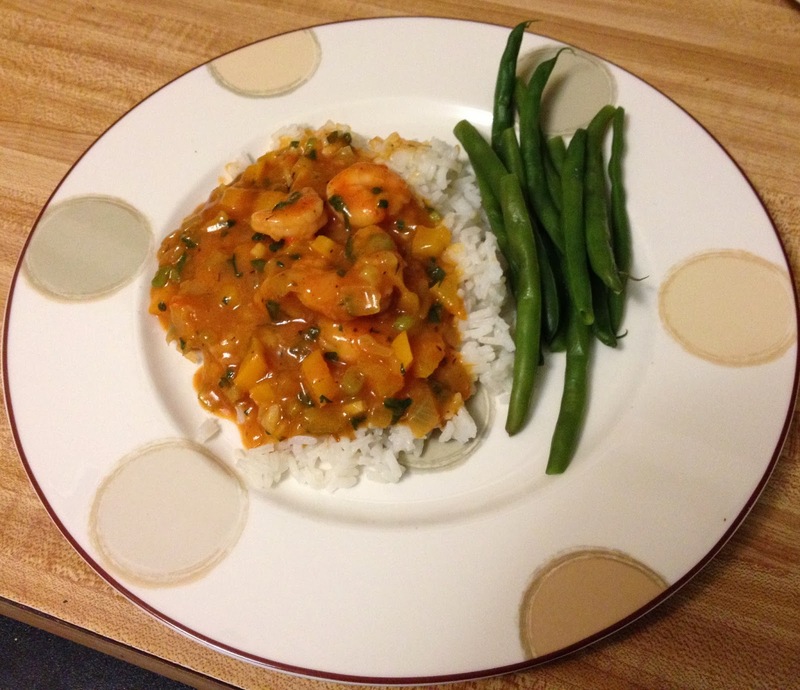 But, one of my all-time favorites was the étouffée. I really miss that dish. I don't know why they didn't revive the old menu when they rebuilt and I still reminisce about the old days. The fact that they served étouffé in the first place was pretty amazing. Of course, theirs was the traditional crawfish étouffé. I've been wanting to make my own forever. I don't know if you noticed, but crawdads are awfully expensive these days. You'd think "mudbugs" would be rather affordable. Not so much. Anyway, I could survive off shrimp alone, so no worries for me. 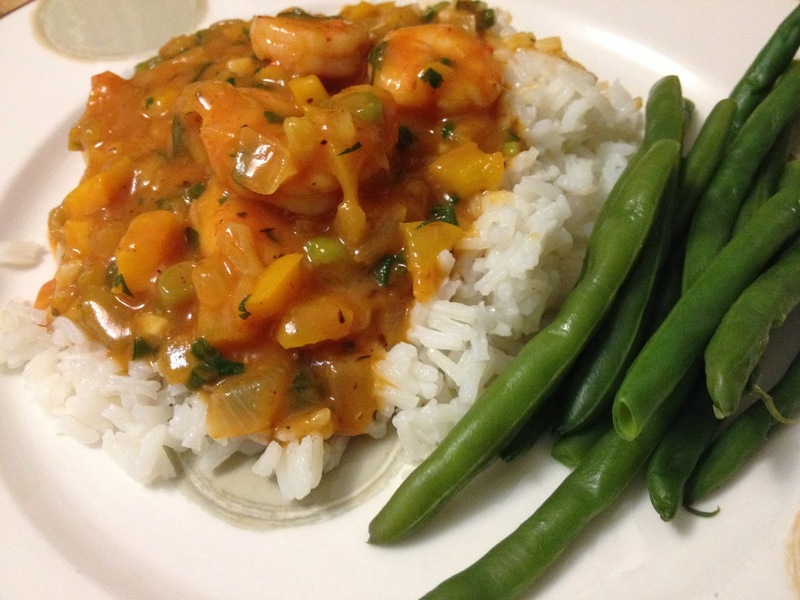 I have finally gotten around to making this dish at home and I am happy to report great results! It all starts off, as so many great dishes do, with a roux. This one needs a roux cooked to about the color of peanut butter. I've never understood some people's intimidation by roux. It's remarkably easy; in fact, Vivian made this one by herself. She's 7. There you have it. Roux isn't hard to do. Add in some yellow bell pepper, onion, celery, garlic (of course! ), bay leaves, thyme, chili powder and water. Cook for awhile then add shrimp. Serve it over rice and enjoy the heck out of it. As most of you know, I gauge a lot of my successes not only by what Neil and I think of the dish, but really what the Vivver thinks. This child ate her entire bowl with no complaints. That makes it a do-again dish Chez Akre!